This is an ‘eccentric’ site in its design and colour scheme, but the content including key diagrams is useful. 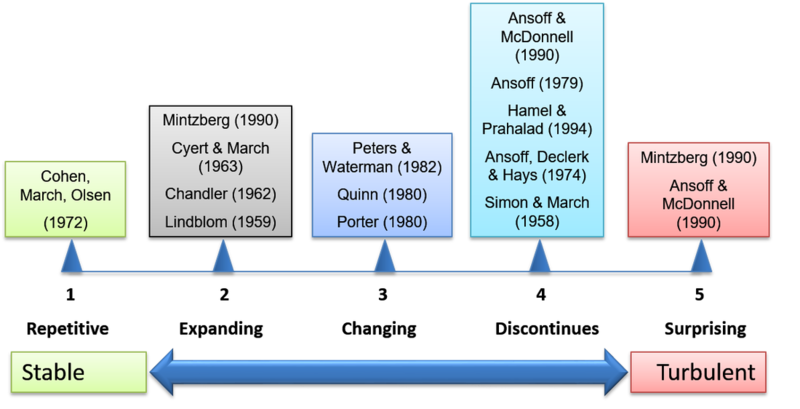 Above the below content on the page linked is a CV and timeline of Ansoff. 2. First to introduce the Umbrella Concept suggesting that different solutions are needed under different levels of turbulence of the Environment. These solutions include business and corporate level strategies. ​H. Igor Ansoff came to USIU in 1983 and founded the School of Strategic Management. He is the only one in the field who has validated his theory supported with consistently high results. There are over 45 Doctorates awarded in the Strategic Management discipline verifying Ansoff’s approach. The findings were empirically validated. All results are available for review at a special edition Compendium of Strategic Management Research. Graduates of the Strategic Management program, from both the Master’s and the Doctoral programs, are holding high positions in industry and academia around the world. Judge the results by the criterion of relevance to reality, and not by the more common criterion of proper attribution to prior work. ​Among the material developed by H. Igor Ansoff, three contributions shaped and influenced theories of strategic thinking: the concept of environmental turbulence, the contingent strategic success paradigm and real-time strategic management. It is a model of the business environment consisting of five turbulence levels, ranging from placid and predictable to highly changeable and unpredictable. For each level of turbulence, Ansoff hypothesized and proven that a different behavior is needed in each level which optimizes an organization’s profitability (1979). A simplified description of the levels of turbulence is shown. In order for an organization to balance both the strategic and operational components, it has to look at both the external and internal environments and align its position to achieve good results. This led to the realization that analysis and interpretation of the organization’s external environment is pivotal to its strategic success. Ansoff constructed a five-point scale of ‘turbulence levels’. These are described by a combination of the changeability of events in the environment. The external environment serves as the key indicator for the organization’s strategic position and its inaccurate perception is “strategic myopia”. 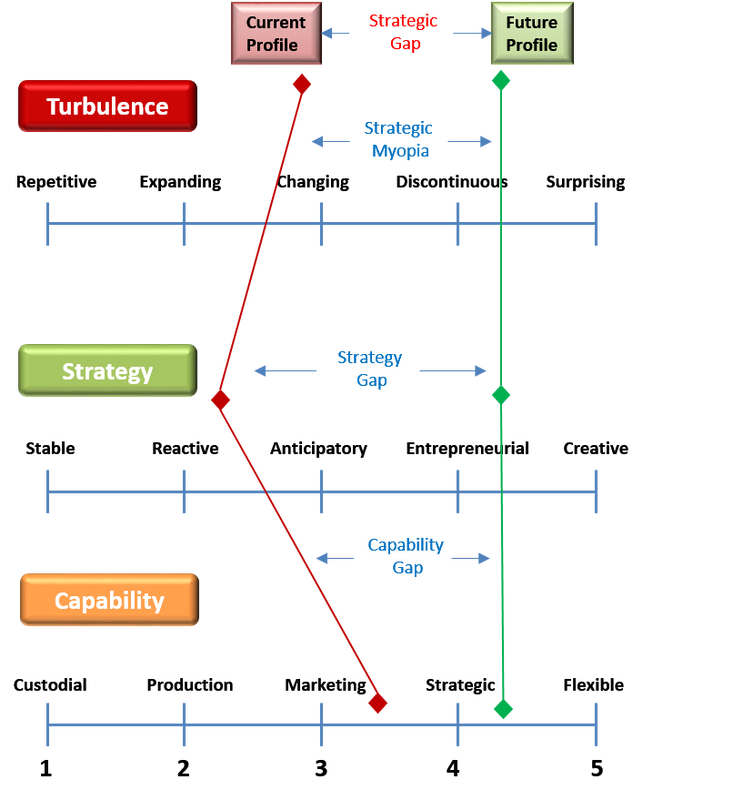 ​Ansoff used the model of turbulence to construct a strategic success paradigm based on three variables: the turbulence levels of the organization’s environment; the aggressiveness of the organization’s strategic behavior in the environment; and the responsiveness of the organization’s management to changes to the environment. The paradigm states that the financial performance of an organization is optimized when the aggressiveness and management responsiveness of the organization both match the turbulence of the organization’s environment (1979). The fact that an organization can be successful at one time and unsuccessful in another led Ansoff to realize that an organization’s strategy has to be aligned with the level of turbulence in which it operates; otherwise its financial performance drops. A matching triplet was designed to show the link between the environment, strategy and capability. 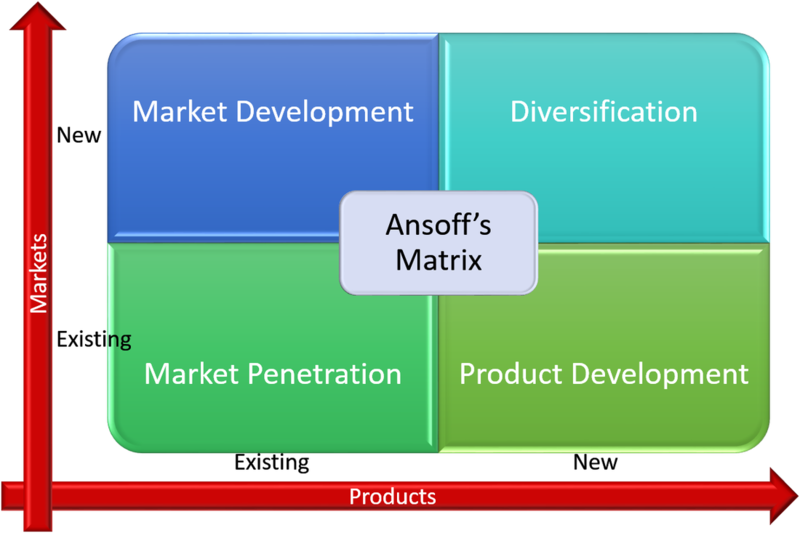 Ansoff challenges the validity of prescriptions for organizations’ success established in the literature. His model does not deny the validity of these prescriptions; on the contrary it places them in a context in which each is valid under a particular set of circumstances dependent on the level of turbulence of the environment. For instance, specific strategic actions could be very appropriate in one level but not so when applied in another level. In order for organizations to attain maximum profitability, they have to interpret the level of environmental turbulence and align their strategy and capability accordingly. While some maintain that there is one prescription for success, Ansoff has empirically proven in a total of more than 2,100 cases around the world (1983 – 1999) that different environments call for different corporate responses. 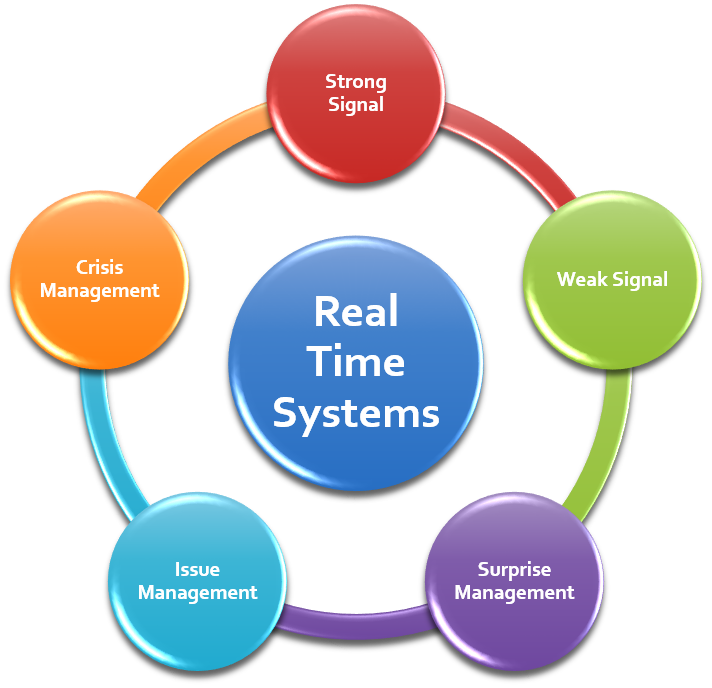 Ansoff developed a diagnostic tool for working managers to diagnose the readiness of their organizations to succeed in turbulent environments. It enables an organization to identify the existence of any gap between its future environment, its current strategy and its current capability. Managers can also use the paradigm to select the strategic approach proposed by the academics and consultants which best fit in the appropriate level of turbulence. There are quite a number of options applicable in each level of turbulence. However, the same strategic option does not guarantee optimal financial performance under all levels of turbulence. One can be appropriate for one but inappropriate for another.